Here at homify we’ve witnessed our fair share of eco homes and passive houses, but none quite as sweet as today’s feature project. Boasting rustic Scandinavian touches, plenty of character as well as an environmentally friendly design and construction, this property is sure to impress. Heart-meltingly and swoon-worthy, this enviable dwelling comes replete with a modern ambience yet employs shabby-chic aesthetics to soften the overall structure and embolden an aura of restful serenity. Conceived by Spanish-based House Habitat, this passive house includes a ventilated façade with maintenance-free sliding, sanitary slab with timber beam construction, cellulose insulation, an aerothermic boiler and air renewal system with energy recovery. 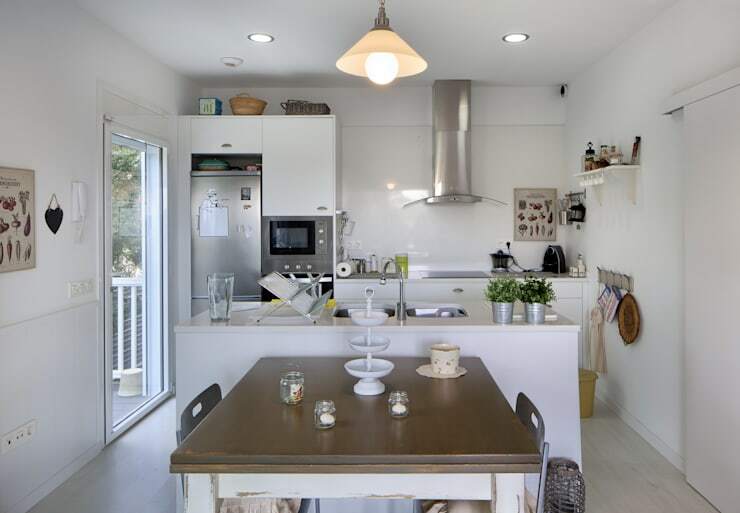 You might be asking what all of this means – essentially it is a low energy home, which maximises its insulation to reduce costs and its impact on the environment. A dreamy and enviable combination of style and charm, our first glance of this property is definitely making us swoon! 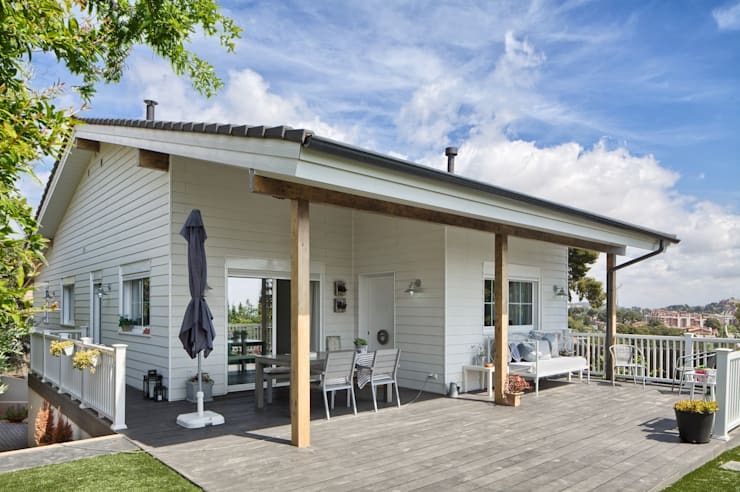 Replete with a white timber façade and traditional gable roof, this dwelling ticks all the boxes. As well as a gorgeously characterful exterior, the architects have also lengthened the roofline to provide an all-weather verandah with seating space. The large deck is perfect for entertaining, and protects the interior from the harsh summer sun. Inside the dwelling the décor and ambience certainly doesn’t disappoint! The interior design is even more alluring and enchanting as we imagined, with an all-white colour scheme punctuated by bright hues and patterned features. In the centre of the living room, a dark black timber burner sits waiting for winter. It is here that the family can gather as the temperature drops, while watching a film on the television. The furniture is a combination of rustic and modern. We see the bright white sofa, as well as the plaid armchair, each offering an element of homeliness and warmth, which adds to the overall sense of comfort. A juxtaposition of contemporary features and beautifully bucolic touches, this interior is truly one-of-a-kind. Bursting with a Nordic air and aura, the kitchen is simple and practical, offering the family a comfortable yet liveable cooking space. Although compact the joinery is well-designed to provide ample space to cook and entertain. Additionally, a dining table is situated next to the breakfast bar to encourage individuals to gather, relax and socialise. Light, bright and airy, the interior of this gorgeous home also boasts an upstairs mezzanine space. 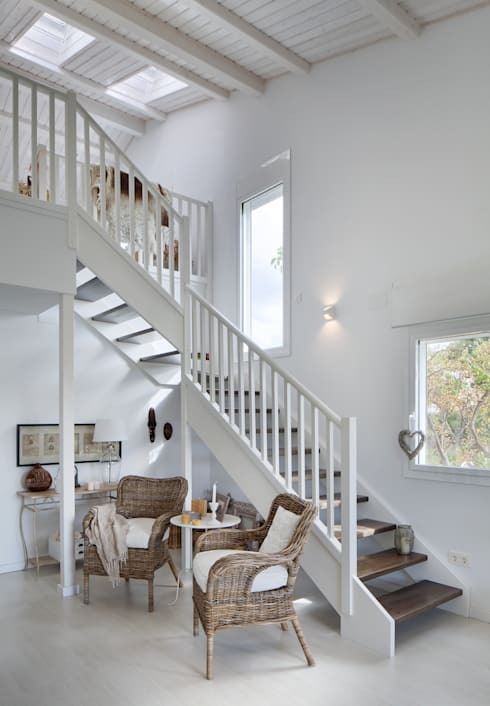 Dark timber stairs lead upward and are matched with the all-white interior scheme, and lovely wicker armchairs. The first bedroom we are taking a peek inside is the child’s room. This cosy area bursts with life and colour thanks to the range of accessories and accoutrements that have been added. 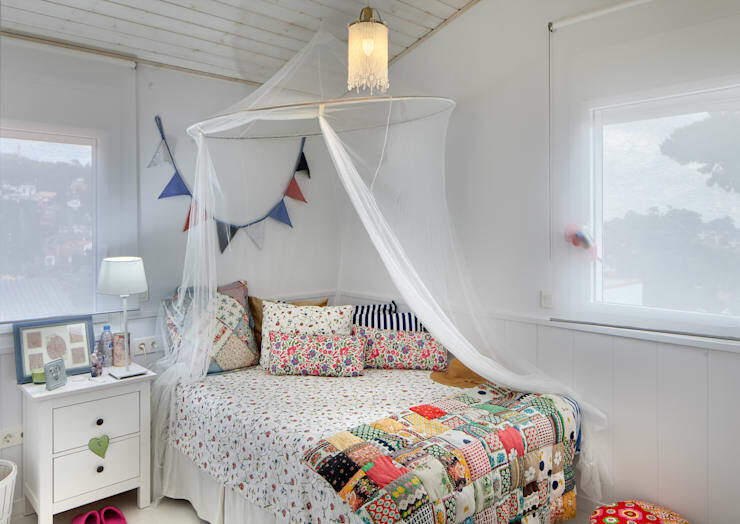 To top things off an overhanging mosquito net is placed to add a practical application of keeping the sleeping area bug free, while also promoting a romantic and whimsical ambience. 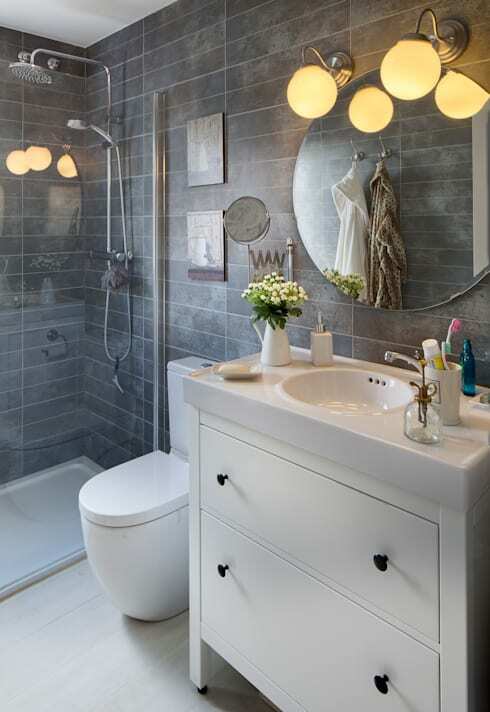 In the bathroom the white modern-rustic scheme is continued, but paired with plenty of modern additions. A rain showerhead adds luxury, while the wall-mounted lights are ambient and retro. As well as incorporating many different styles within this space, the room is timeless and enduring, ensuring it will last the distance and offer an age-defiant style. The final room we will check out before we end our tour is the master suite. In this room we see the crisp white hues paired with some fabulous patterns, which bring out a sense of character and charm. 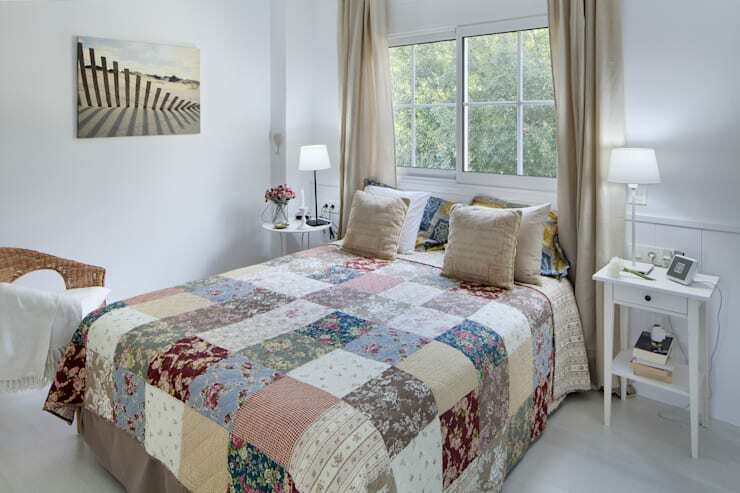 Charismatic and sumptuous, the space is effortlessly chic, in a shabby and on-trend way. What elements of this cute cottage would you employ in your own home?